“Get your kicks on Route 66” goes the song. As someone who grew up on rock and roll and dreamt of the wide spaces of America from Glasgow, Billy Connolly has always had a fascination with the iconic Route 66. In Billy Connolly’s Route 66, he travels the famous Mother Road, and invites us all along for the ride. Stretching from Chicago to Los Angeles, Route 66 travels through many famous places, and is an integral part of the California dream – travelled by millions in search of a better life on the West Coast, particularly by the “Okies” escaping the dust bowl of Oklahoma during the great depression. Now however, with much of the small towns which relied on passing trade bypassed by the Interstate highway, the road is dying. Some towns and businesses are enterprising and manage to continue to attract visitors, but there are many more abandoned houses and premises. Billy Connolly will, of course, be familiar to most as one of the greatest stand-up comedians, and a Scottish national treasure. He has made various travel shows in the past, including his World Tour of Scotland, and is known for his love of connecting with people while travelling. 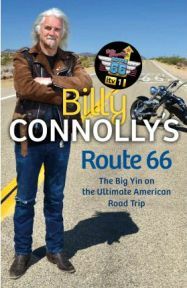 Billy Connolly’s Route 66 is a television show first and foremost, and the book accompanies it (there is also a soundtrack available if you are interested). I read the book before watching the TV show; admittedly, I forgot to watch the show on ITV and have had to watch it on catch-up after reading the book. The book of Billy Connolly’s Route 66 is reasonably light and easy read, as many TV tie-in books are, but is nonetheless thoroughly interesting, packed with loads of fascinating information about the history of Route 66 and the states it passes through. As you read it you can imagine Billy speaking it aloud to you; it is written in his slightly rambly style, although is generally much more focussed than his stand-up shows where he can go off on three tangents before getting back to the original point (which is not a bad thing at all for stand-up comedy). Billy shares with us his experiences on the trip, and also his thoughts on what he sees. He meets some truly fascinating people along the way, some of them admittedly more than a little eccentric – but then Billy is not a fan of “beige” people, those who are a bit bland and have nothing interesting to say. He is very open about how he feels about these people in the book of Billy Connolly’s Route 66, and his reaction to most is wonderfully positive. Some of them could easily be dismissed as oddballs, but Billy presents them as unique and interesting, illustrating the character of the old Route 66. If you have ever read a TV tie-in book, you will know that you tend to get a lot more information from them than from the show itself, such is the nature of the two genres. Billy Connolly’s Route 66 is no exception. Not only do we hear more about the journey itself (although of course we see most of the towns and places of interest on the show), but Billy shares more of his own thoughts on the journey and what he sees in the book. In most cases, from watching the show you will know whether Billy has a positive or negative reaction to something or someone, but not all. One example is the rodeo he visits in Arizona – the impression we get from the TV show is that he finds it an interesting experience, if a little strange, but the book of Billy Connolly’s Route 66 makes it clear that by the end he feels very negative about the whole thing. The book contains a good selection of full colour photographs from the trip, most of which will be familiar from the show. The photos really help to show you the places and people that Billy writes about, some of which would be hard to imagine if you hadn’t seen the TV show. If you pick up Billy Connolly’s Route 66 in the expectation of it being constantly hilarious like Billy’s stage shows, you’re going to be disappointed. Of course it is funny – often laugh out loud and frequently gently amusing, but the aim of Billy Connolly’s Route 66 is clearly not to make people laugh, but to go on a journey, to be shared with the viewers and readers, and to learn a little something (or a few little somethings). Ultimately, the aim of any travel book or TV show (whether a conscious or unconscious aim) is to make the audience want to visit the locations shown – even if this is not the outright intent of the creator, they will generally want to engage their audience which, if done right, should have the effect of the audience wanting to visit. So, does Billy Connolly’s Route 66 deliver in this respect? It certainly does. Between the incredible scenery and windswept and interesting people, it made me wish I could travel Route 66, with some old fashioned rock and roll blaring from the stereo. A large part of this is of course down to Billy himself – he is an engaging presenter and writer, and in everything he does, he makes you feel like you are an old pal. Billy Connolly’s Route 66 is a really interesting and enjoyable read, if a little sad at times given the current state of Route 66 and its towns. Recommended to all travellers and vicarious travellers like myself – pick up the book, turn the stereo on, and join Billy to get your kicks on Route 66. Many thanks to Quercus for providing a review copy of Billy Connolly’s Route 66. No Comments on "Billy Connolly’s Route 66"